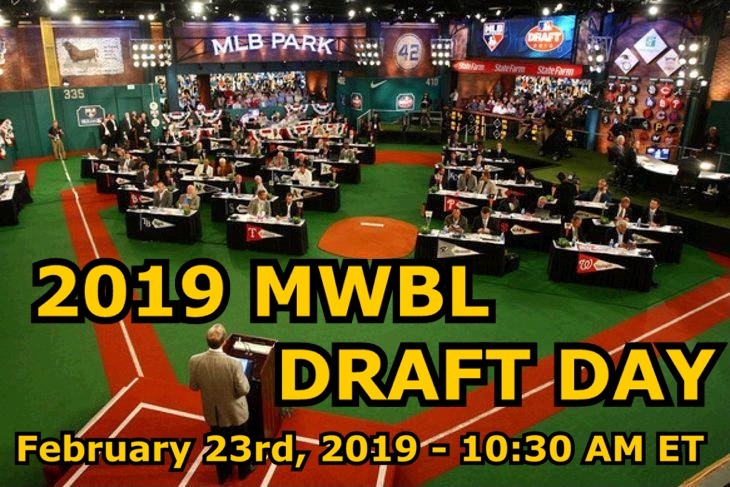 The 2019 Mid-West Baseball League Draft is scheduled for Saturday February 23rd, 2019 at 10:30 AM ET. The 2019 MWBL Draft Order has now been posted including the winning lottery teams & the complete 336 Pick, 15 Round Selection Order has been posted. The Long Beach Dirtbags held on during the Lottery & will have the #1 Pick in the 2019 Mid-West Baseball League Draft. Again this year will be start time of 10:30 AM ET to allow the West Coast Franchise Owners a few extra minutes of sleep. Please be advised that with this start time, the 2019 MWBL Draft will conclude later in the day for the East Coast Contingent, so please adjust your plans accordingly. New this year will be 3 Extra Rounds, which will NOT be done live, but in a E-Mail portion of the Draft a few days after Draft Day. Only CARDED PLAYERS will be available during this portion of the Draft. Details will follow as we get closer to the 2019 MWBL Draft Day.